I always knew that we would have a rack train running through our layout and I had a general idea about where I wanted the two stations, but it was not until the waterfalls were built and the European section cleared of construction debris, that I knew exactly what I wanted. One station is located next to the waterfall and the other would be next to the European station. There was a large problem in the way - how to connect the two stations! The track would have to cross over the creek, weave behind the Shay line and cross over the Orient Express, then start to descend as it crossed the RhB to get to the Euro station. The plan was to build an arched viaduct out of concrete to connect the two stations. Seventeen arches in total were constructed using coffee cans, paint cans, and wood forms as a guide. An LGB reversing unit controls the railway. 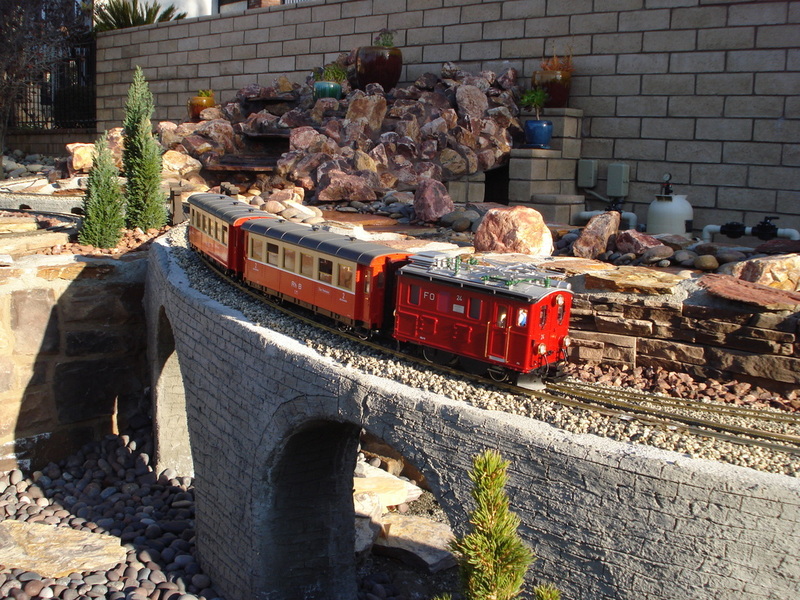 The 43' long line ascends 19 inches as it weaves through the layout. It was an engineering feat to connect points A and B to say the least! A rack train makes its way over the largest bridge on the line.